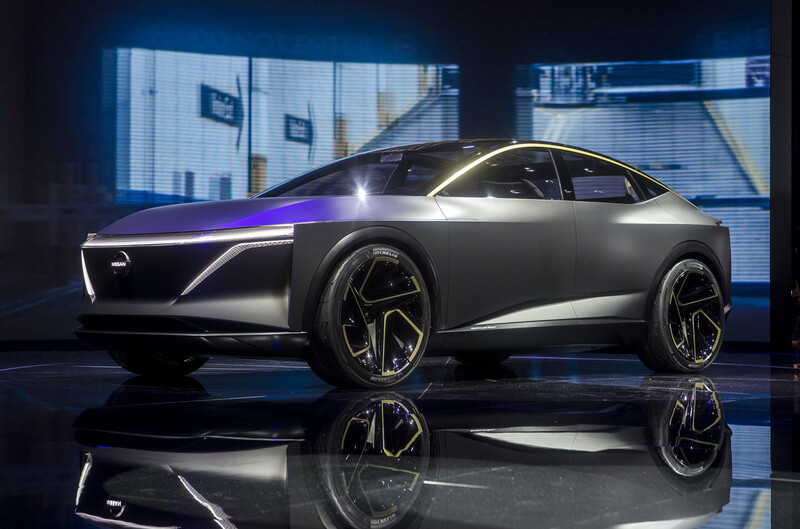 On the occasion of the Detroit Motor Show that opened yesterday its doors to the press, Nissan has unveiled an electric prototype called Nissan IMs EV Sports Sedan concept whose objective is the most ambitious. According to the Japanese manufacturer, it is designed to create a totally new segment. This IMs prototype is a saloon sports raised and 100% electric , with four-wheel drive, autonomous driving mode and also has a quite peculiar seating configuration, 2 + 1 + 2 . At the CES of Las Vegas, Nissan also announced that by 2022 it would launch 7 electric models to the market. Aesthetically, the brand says that it follows the “V-Motion” design language of the rest of the range, but updated by a more futuristic look, an imposing front without a grille and with headlights that seem to occupy the entire width of the vehicle (and that turn blue if the vehicle is running autonomously), or huge 22-inch wheels. Also noteworthy are the absence of a central pillar, the reverse-opening rear doors, the glass roof, the ‘liquid metal’ paint , the gold-colored details or the “holographic” tail lights, which also occupy the entire width of the car . The propulsion system of this concept is based on two electric motors , each on a vehicle axis, with a combined power of 360 kW ( 490 HP ) and a maximum torque of 800 Nm . Thanks to a 115 kWh battery , the estimated autonomy amounts to 612 kilometers . The suspension, on the other hand, is pneumatic. One of the most striking aspects of the car is the configuration of its interior , which is designed for daily movements in which the vehicle takes control and drives by itself. Thus, it seeks amplitude , comfort and, according to Nissan, the design is inspired by modern Japanese homes. The “Premier Seat” arrangement of its passenger compartment consists of two front seats, a single and central seat in the second row and two additional seats in the rear. At the level of colors, dark tones predominate inside, although there are many details in the same gold that we find in various components of the exterior (including the rims). Everything in the interior has a futuristic design, from the digital instrument panel, consisting of four screens, to the dashboard or console, also dominated by screens. The steering wheel, for example, has a rectangular shape and rotating controls, as well as a backlit logo and details in the omnipresent golden tone. When the autonomous driving mode is activated, the steering wheel retracts and the front seats are turned to face the rear center seat.